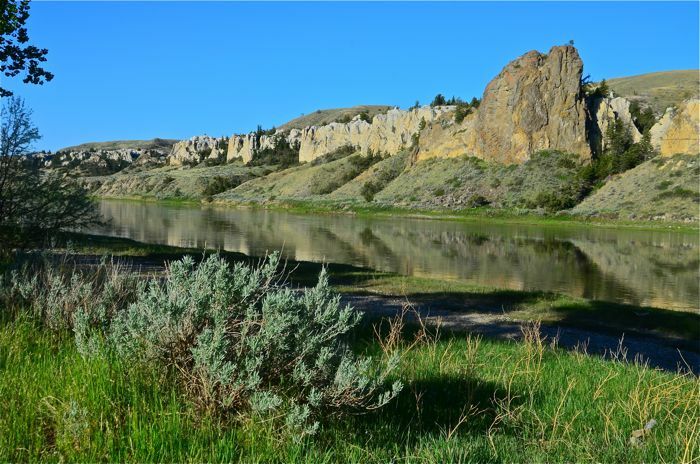 North-central Montana’s Upper Missouri River Breaks National Monument is a spectacular landscape of sandstone cliffs, rolling sagebrush-grassland hills, colorful “badlands,” and verdant riverside patches of willow and cottonwoods. The upper Missouri is a big but gentle river, flowing mostly through a wilderness environment little changed from the days of Lewis & Clark. Unlike Lewis & Clark, though, we will float and paddle downstream, and we’ll cover 110 river miles. The diversity of bird life is amazing; it is a bird-watchers’ paradise! Deer, bighorn sheep, and other native species also abound, and we usually see lots of wildlife. Springtime weather is quite variable, from hot sun to sudden rain or even snow. The trip varies from easy to fairly strenuous, depending upon wind and weather. The trip base is Great Falls, Montana. This odyssey will take us from Coal Banks Landing, an hour east of Great Falls, to the Kipp Recreation Area, where U.S. Highway 191 crosses “Big Mo”, deep in the prairies and breaks of north-central Montana. Don’t miss this great opportunity to camp where Lewis & Clark camped, to explore the same ridges and coulees, and to paddle the same waters! This stretch of the Missouri is loaded with history and historic relics, and most of the area remains unspoiled. It was Lewis & Clark’s gateway into the Rocky Mountains. TRIP BASE: O’Haire Motor Inn, 7th Street and 1st Avenue South, Great Falls, Montana, 800-332-9819. Call motel in advance for airport shuttles. There is major airline service to Great Falls. MEETING TIME: Pre-trip orientation including food and gear handout plus safety talk at 6 PM the evening prior to the first day of the trip. For example, if the trip is the 16th-23rd, we meet at 6 PM on the 15th in the O’Haire lobby. TRIP DIFFICULTY: Generally mellow with the river current doing much of the work, but canoeing can be strenuous into a head wind. There will be opportunities to day hike, and moving gear from canoes to tent sites requires physical labor, too. There are no whitewater rapids, but there are a few riffles that are easy to negotiate. No canoeing experience is required. Please inform us if you do not know how to swim! WEATHER: Spring in north-central Montana is fickle. Sudden radical weather changes occur. A hot sunny day can quickly become cold and rainy; it may even snow. Thunderstorms are typically brief but intense. Usually, the weather is nice with daytime temperatures in the 60’s, but be prepared! Click here for the National Weather Service forecast. 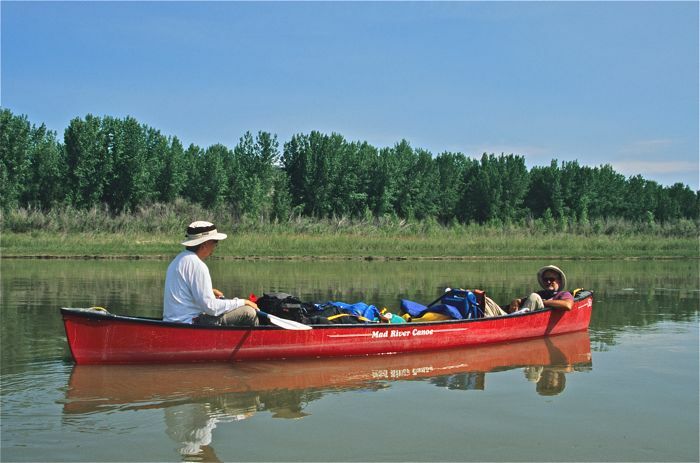 SPECIAL FEATURES: A unique chance to experience real northern Great Plains wilderness, with cottonwood trees along the river and pines on the slopes and in the draws. Plenty of very scenic buttes and cliffs. Deer, antelope, bighorn sheep, coyote, beaver and other native species abound. 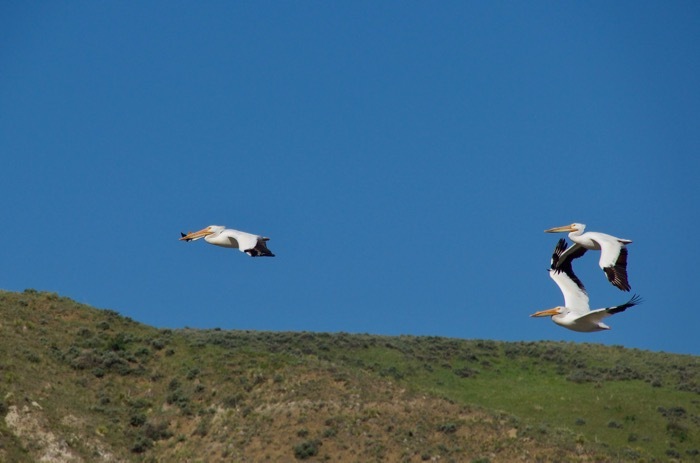 Great bird watching for waterfowl, raptors, migratory and nesting songbirds and more! A few roads, mostly dirt, wind down to the river, but most of this 110-mile trip is roadless wilderness. When it rains, the famous Missouri River “gumbo” (clay) will stick to your shoes. Visit landmarks “discovered” by Lewis and Clark; camp where they camped! SPECIAL TIPS: If your hands aren’t callused, bring some paddling gloves. Sunscreen and good sunglasses are essential! Rattlesnakes will be out in warm weather. Bring comfortable lightweight hiking boots for day hiking. Good binoculars will aid greatly in viewing birds and other wildlife. 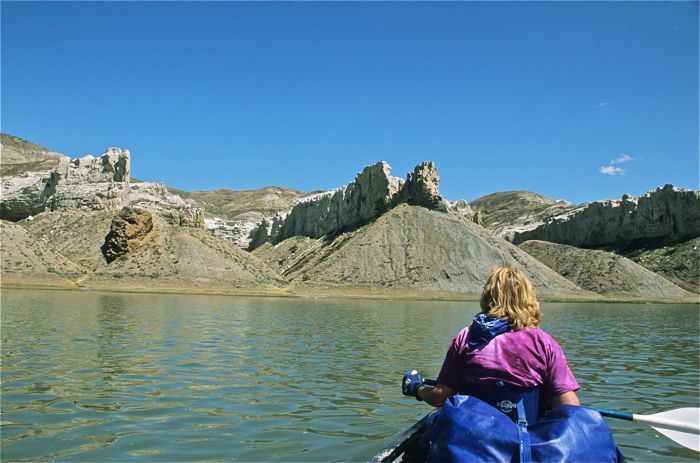 STATUS: Most of the trip is on the designated Wild Missouri National River within the Upper Missouri River Breaks National Monument, managed by the BLM, with a few private scattered ranch parcels. The last section is within the Charles M. Russell National Wildlife Refuge. Most of Federal lands are eligible to be added to the National Wilderness Preservation system. ITINERARY: We’ll have one, possible two layovers, depending upon our progress. At the end of the trip, a pre-arranged vehicle shuttle back to the put-in will take about 4 hours. On the river, there’s no rigid itinerary; we will, literally and figuratively, go with the flow. *Trip price includes equipment (canoe/paddles/life jackets, tent, sleeping bag and pad, eating utensils), food and cooking (3 meals/day plus snacks), cooking gear, trip planning, comprehensive safety instruction, all user/permit fees, transportation from town to and from the trailheads, and our professional guide/naturalist staff. There is a $300 discount if you bring your own tent, sleeping bag & pad, and cup/bowl/spoon). At the link below, is information about our Montana backpacking and canoe trips, which also often include backpacking trips in Yellowstone Park.